For earlier events, see Timeline of natural history. This timeline of human prehistory comprises the time from the first appearance of Homo sapiens in Africa 200,000 years ago to the invention of writing and the beginning of history approximately 5,500 years ago. It covers the time from the Middle Paleolithic (Old Stone Age) to the very beginnings of the Bronze Age. The divisions used are those delineating the European Stone Age; however, many regions around the world underwent various stages of Stone Age development at different times. All dates are approximate and based on research in the fields of anthropology, archaeology, genetics, geology, and linguistics. They are all subject to revision based on new discoveries or analyses. 200,000 years ago: first appearance of homo sapiens in Africa. 200,000–180,000 years ago: time of mitochondrial Eve and Y-chromosomal Adam. 195,000 years ago: oldest homo sapiens fossil—from Omo, Ethiopia. 170,000 years ago: humans first start to wear clothing. 125,000 years ago: peak of the Eemian Stage interglacial. 120,000–90,000 years ago: Abbassia Pluvial in North Africa—the Sahara desert region is wet and fertile. 82,000 years ago: small perforated seashell beads from Taforalt in Morocco are the earliest evidence of personal adornment found anywhere in the world. 70,000 years ago: earliest example of abstract art or symbolic art from Blombos cave, South Africa—stones engraved with grid or cross-hatch patterns. 64,000 years ago: The bow and arrow first replace the spear thrower in Africa. 50,000 years ago: earliest needle found. Made and used by Denisovans. 50,000–30,000 years ago: Mousterian Pluvial in North Africa. The Sahara desert region is wet and fertile. Later Stone Age begins in Africa. 45,000–43,000 years ago: Cro-Magnon colonization of Europe. 45,000–40,000 years ago: Chatelperronian culture in France. 42,000 years ago: Paleolithic flutes in Germany. 42,000 years ago: earliest evidence of advanced deep sea fishing technology at the Jerimalai cave site in East Timor—demonstrates high-level maritime skills and by implication the technology needed to make ocean crossings to reach Australia and other islands, as they were catching and consuming large numbers of big deep sea fish such as tuna. 41,000 years ago: Denisova hominin lives in the Altai Mountains. 40,000 years ago: extinction of Homo neanderthalensis. 40,000 years ago: Aurignacian culture begins in Europe. 40,000 years ago: oldest known figurative art the zoomorphic Löwenmensch figurine. 40,000 years ago: oldest known cave paintings. Red dots, hand stencils and animal figures in Altamira Cave, El Castillo, Spain. 40,000–30,000 years ago: First human settlement (Aboriginal Australians) in Sydney, Perth and Melbourne. 40,000–20,000 years ago: oldest known ritual cremation, the Mungo Lady, in Lake Mungo, Australia. 35,000 years ago: oldest known figurative art of a human figure as opposed to a zoomorphic figure (Venus of Hohle Fels). 33,000 years ago: oldest known domesticated dog skulls show they existed in both Europe and Siberia by this time. 30,000 years ago: rock paintings tradition begins in Bhimbetka rock shelters in India, which presently as a collection is the densest known concentration of rock art. 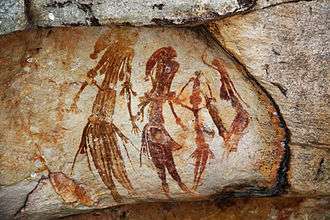 In an area about 10 km2, there are about 800 rock shelters of which 500 contain paintings. 28,500 years ago: New Guinea is populated by colonists from Asia or Australia. 28,000 years ago: oldest known twisted rope. 28,000–20,000 years ago: Gravettian period in Europe. Harpoons and saws invented. 28,000–24,000 years ago: oldest known pottery—used to make figurines rather than cooking or storage vessels (Venus of Dolní Věstonice). 26,000 years ago: people around the world use fibers to make baby carriers, clothes, bags, baskets, and nets. 26,000–20,000 years ago: Last Glacial Maximum. 25,000 years ago: a hamlet consisting of huts built of rocks and of mammoth bones is founded in what is now Dolni Vestonice in Moravia in the Czech Republic. This is the oldest human permanent settlement that has yet been found by archaeologists. 21,000 years ago: artifacts suggests early human activity occurred in Canberra, the capital city of Australia. 20,000 years ago: Kebaran culture in the Levant. 20,000 years ago: oldest pottery storage/cooking vessels from China. 16,500–13,000 years ago: first colonization of North America. 16,000 years ago: Wisent sculpted in clay deep inside the cave now known as Le Tuc d'Audoubert in the French Pyrenees near what is now the border of Spain. 15,000 years ago (13,000 BC): The woolly rhinoceros goes extinct. 15,000–14,700 years ago (13,000 to 12,700 BC): Earliest supposed date for the domestication of the pig. 14,800 years ago: The Humid Period begins in North Africa. The region that would later become the Sahara is wet and fertile, and the Aquifers are full. 13,000–10,000 years ago: Late Glacial Maximum, end of the Last glacial period, climate warms, glaciers recede. 13,000 years ago (11,000 BC): A major outbreak occurs on Lake Agassiz, which at the time could have been the size of the current Black Sea and the largest lake on Earth. Much of the lake is drained in the Arctic Ocean through the Mackenzie river. 13,000–11,000 years ago (11,000 to 9,000 BC): Earliest dates suggested for the domestication of the sheep. 12,000 years ago: Jericho has evidence of settlement dating back to 10,000 BC. Jericho was a popular camping ground for Natufian hunter-gatherer groups, who left a scattering of crescent microlith tools behind them. 12,000 years ago (10,000 BC): Earliest dates suggested for the domestication of the goat. 12,000 years ago (10,000 BC): Land ice leaves Denmark and southern Sweden; start of the current Holocene epoch. 11,000 years ago (9,000 BC): Earliest date recorded for construction of temenoi ceremonial structures at Göbekli Tepe in southern Turkey, as possibly the oldest surviving proto-religious site on Earth. 11,000 years ago (9,000 BC): Emergence of Jericho, which is now one of the oldest continuously inhabited cities in the world. Giant short-faced bears and giant ground sloths go extinct. Equidae goes extinct in North America. 10,500 years ago (8,500 BC): Earliest supposed date for the domestication of cattle. 10,000 years ago (8,000 BC): The Quaternary extinction event, which has been ongoing since the mid-Pleistocene, concludes. Many of the ice age megafauna go extinct, including the megatherium, woolly rhinoceros, Irish elk, cave bear, cave lion, and the last of the sabre-toothed cats. The mammoth goes extinct in Eurasia and North America, but is preserved in small island populations until ~1650 BC. 11,000 – 9,000 years ago: Byblos appears to have been settled during the PPNB period, approximately 8800 to 7000 BC. Neolithic remains of some buildings can be observed at the site. 10,000 – 8,000 years ago (8000 BC to 6000 BC): The Post Glacial Sea Level Rise decelerates, slowing the submersion of landmasses that had taken place over the previous 10,000 years. 10,000 – 9000 years ago (8000 BC to 7000 BC): In northern Mesopotamia, now northern Iraq, cultivation of barley and wheat begins. At first they are used for beer, gruel, and soup, eventually for bread. In early agriculture at this time, the planting stick is used, but it is replaced by a primitive plow in subsequent centuries. Around this time, a round stone tower, now preserved to about 8.5 meters high and 8.5 meters in diameter is built in Jericho. 9,500–5,900 years ago: Neolithic Subpluvial in North Africa. The Sahara desert region supports a savanna-like environment. Lake Chad is larger than the current Caspian Sea. An African culture develops across the current Sahel region. 9,500 years ago (7500 BC): Çatal Höyük urban settlement founded in Anatolia. Earliest supposed date for the domestication of the cat. 9,200 years ago: First human settlement in Amman, Jordan; 'Ain Ghazal Neolithic settlement was built spanning over an area of 15 hectares. 9,000 years ago (7000 BC): Jiahu culture began in China. 8,200–8,000 years ago: 8.2 kiloyear event: a sudden decrease of global temperatures, likely caused by the final collapse of the Laurentide ice sheet, which leads to drier conditions in East Africa and Mesopotamia. 8,000 years ago: Evidence of habitation at the current site of Aleppo dates to about c. 8,000 years ago, although excavations at Tell Qaramel, 25 kilometers north of the city show the area was inhabited about 13,000 years ago, Carbon-14 dating at Tell Ramad, on the outskirts of Damascus, suggests that the site may have been occupied since the second half of the seventh millennium BC, possibly around 6300 BC. However, evidence of settlement in the wider Barada basin dating back to 9000 BC exists. 7,500 years ago (5500 BC): Copper smelting in evidence in Pločnik and other locations. 7,200–6,000 years ago: 5200–4000 BC:Ghar Dalam phase on Malta. First farming settlements on the island. 7,000 years ago (5000 BC): late Neolithic civilizations, invention of the wheel and spread of proto-writing. The oldest golden treasure found in Varna Necropolis, Bulgaria. 6,100–5,800 years ago: 4100–3800 BC: Żebbuġ phase. Malta. 6,070–6,000 years ago (4050–4000 BC): Trypillian build in Nebelivka (Ukraine) settlement which reached 15,000—18,000 inhabitants. 6,000 years ago (4000 BC): Civilizations develop in the Mesopotamia/Fertile crescent region (around the location of modern-day Iraq). Earliest supposed dates for the domestication of the horse and for the domestication of the chicken. 5,900 years ago: 5.9 kiloyear event: a rapid and intense aridification event, which likely started the current Sahara Desert dry phase and a population increase in the Nile Valley due to migrations from nearby regions. It is also believed this event contributed to the end of the Ubaid period in Mesopotamia. 5,800 years ago: (3840 to 3800 BC): The Post Track and Sweet Track causeways are constructed in the Somerset Levels. 5,800 years ago (3800 BC): Trypillian build in Talianki (Ukraine) settlement which reached 15,600—21,000 inhabitants. 5,800–5,600 years ago: (3800–3600 BC): Mġarr phase A short transitional period in Malta's prehistory. It is characterized by pottery consisting of mainly curved lines. 5,700 years ago (3800 to 3600 BC): mass graves at Tell Brak in Syria. 5,700 years ago (3700 BC): Trypillian build in Maidanets (Ukraine) settlement which reached 12,000—46,000 inhabitants, and built 3-storey building. 5,700 years ago: (3700 to 3600 BC): Minoan culture begins on Crete. 5,600–5,200 years ago (3600–3200 BC): Ġgantija phase on Malta. Characterized by a change in the way the prehistoric inhabitants of Malta lived. 5,500 years ago: (3600 to 3500 BC): Uruk period in Sumer. First evidence of mummification in Egypt. 5,300 years ago: (3300 BC): Bronze Age begins in the Near East Newgrange is built in Ireland. Hakra Phase of the Indus Valley Civilization begins in the Indian Sub-continent. 5,300–5,000 years ago (3300-3000 BC): Saflieni phase in Maltese prehistory. 5,200 years ago: (3200 BC): Writing is invented in Sumer, triggering the beginning of history. For later events, see Timeline of ancient history. ↑ "What does it mean to be human? Homo sapiens". Smithsonian Museum of Natural History. ↑ Ewen Callaway (6 August 2013). "Genetic Adam and Eve did not live too far apart in time". Nature. ↑ Erin Wayman (11 January 2012). "Meet the Contenders for Earliest Modern Human". smithsonian.com. ↑ "Lice DNA study shows humans first wore clothes 170,000 years ago". ScienceDaily. 7 January 2011. ↑ "World's Oldest Manufactured Beads Are Older Than Previously Thought". Sciencedaily.com. 7 May 2009. Retrieved 2013-11-22. ↑ "Mount Toba Eruption – Ancient Humans Unscathed, Study Claims". Retrieved 2008-04-20. ↑ "'Oldest' prehistoric art unearthed". BBC News. 10 January 2002. ↑ "World's oldest needle found in Siberian cave that stitches together human history". Siberian Times. 23 August 2016. ↑ John Noble Wilford (3 November 2011). "Fossil Teeth Put Humans in Europe Earlier Than Thought". The New York Times. p. A4. 1 2 Tom Higham; Katerina Douka; Rachel Wood; Christopher Bronk Ramsey; Fiona Brock; Laura Basell; Marta Camps; Alvaro Arrizabalaga; Javier Baena; Cecillio Barroso-Ruíz; Christopher Bergman; Coralie Boitard; Paolo Boscato; Miguel Caparrós; Nicholas J. Conard; Christelle Draily; Alain Froment; Bertila Galván; Paolo Gambassini; Alejandro Garcia-Moreno; Stefano Grimaldi; Paul Haesaerts; Brigitte Holt; Maria-Jose Iriarte-Chiapusso; Arthur Jelinek; et al. (21 August 2014). "The timing and spatiotemporal patterning of Neanderthal disappearance". Nature (512): 306–309. doi:10.1038/nature13621. ↑ Corbyn, Zoë (24 November 2011). "Archaeologists land world's oldest fish hook". Nature News. Retrieved 22 October 2014. ↑ O'Connor, Sue; Ono, Rintaro (25 November 2011). "Pelagic Fishing at 42,000 Years Before the Present and the Maritime Skills of Modern Humans". Science. AAAS. 334 (6059): 1117–1121. doi:10.1126/science.1207703. Retrieved 22 October 2014. ↑ William E. Banks; Francesco d'Errico; João Zilhão (2013). "Revisiting the chronology of the Proto-Aurignacian and the Early Aurignacian in Europe: A reply to Higham et al. 's comments on Banks et al. (2013)". Journal of Human Evolution. doi:10.1016/j.jhevol.2013.08.004. ↑ Amos, Jonathan (15 June 2012). "Red dot becomes 'oldest cave art'". BBC News. Retrieved 15 June 2012. ↑ Macey, Richard (15 September 2007). "Settlers' history rewritten: go back 30,000 years". The Sydney Morning Herald. Retrieved 5 July 2014. ↑ Elizabeth Landau (14 November 2013). "Dogs first domesticated in Europe, study says". CNN. ↑ "Ancient domesticated dog skull found in Siberian cave: 33,000 years old". ScienceDaily. 24 January 2012. ↑ "Rock Shelters of Bhimbetka". World Heritage Site. Archived from the original on 8 March 2007. Retrieved 2007-02-15. 1 2 Adam Benton (5 July 2012). "The oldest pottery discovered". EvoAnth. ↑ Stuart, Gene S. (1979). "Ice Age Hunters: Artists in Hidden Cages". Mysteries of the Ancient World. National Geographic Society. p. 19. ↑ Flood, J. M.; David, B.; Magee, J.; English, B. (1987). "Birrigai: a Pleistocene site in the south eastern highlands". Archaeology in Oceania. 22: 9–22. ↑ Stuart, Gene S. (1979). "Ice Age Hunters: Artists in Hidden Cages". Mysteries of the Ancient World. National Geographic Society. pp. 8–10. ↑ "Shift from Savannah to Sahara was Gradual," by Kenneth Chang, The New York Times, 9 May 2008. ↑ Mithen, Steven (2006). After the ice: a global human history, 20,000–5000 BC (1st Harvard University Press pbk. ed.). Cambridge, Mass. : Harvard University Press. p. 57. ISBN 0-674-01999-7. ↑ Curry, Andrew (November 2008). "Gobekli Tepe: The World's First Temple?". Smithsonian.com. Retrieved 2 August 2013. ↑ E. J. Peltenburg; Alexander Wasse; Council for British Research in the Levant (2004). Garfinkel, Yosef., "Néolithique" and "Énéolithique" Byblos in Southern Levantine Context* in Neolithic revolution: new perspectives on southwest Asia in light of recent discoveries on Cyprus. Oxbow Books. ISBN 978-1-84217-132-5. Retrieved 18 January 2012. ↑ Vogel, J. C. and Waterbolk, H. T., "Groningen Radiocarbon Dates X", Radiocarbon, 14, 6–110 / 105, 1972. ↑ "No-Till: The Quiet Revolution," by David Huggins and John Reganold, Scientific American, July 2008, pp. 70–77. ↑ Scarre, Chris, ed. (2005). The Human Past. Thames & Hudson. p. 222. ↑ Moore, A. M. T. The Neolithic of the Levant. Oxford, UK: Oxford University, 1978. 192–198. Print. ↑ "The prehistoric archaeology of the temples of Malta". Bradshaw Foundation. ↑ Thomas K. Harper. "The effect of climatic variability on population dynamics of the Cucuteni-Tripolye cultural complex and the rise of the Western Tripolye giant-settlements" (PDF). Chronikajournal.com. Retrieved 2016-11-14. ↑ Trypillia Mega-Sites and European Prehistory: 4100-3400 BCE. Books.google.dk. 2016-01-22. p. 347. Retrieved 2016-11-14. ↑ Müller, Johannes; Rassmann, Knut; Videiko, Mykhailo (22 January 2016). "Trypillia Mega-Sites and European Prehistory: 4100-3400 BCE". Routledge. Retrieved 13 November 2016 – via Google Books. ↑ "High precision Tripolye settlement plans, demographic estimations and settlement organization". Academia.edu. Retrieved 13 November 2016. ↑ "ДОСЛІДИ З ТРИПІЛЬСЬКОГО ДОМОБУДІВНИЦТВА" (PDF). Inst-ukr.lviv.ua. Retrieved 2016-11-14. Kristian Kristiansen; Thomas B. Larsson (2005). The Rise of Bronze Age Society: Travels, Transmissions and Transformations. Cambridge University Press. ISBN 9780521843638. Ross Burns (2005). Damascus : A History. Routledge. ISBN 9781134488506.